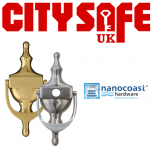 Here at CitySafe UK we have available a wide range of high quality Nanocoast door hardware, which allows you to offer your customers an extensive choice of products that will look just as perfect as the day it was fit onto the door. 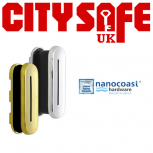 Our range of Nanocoast Door Hardware has been specifically designed for homes that are located in heavily polluted and coastal areas in order to ensure that the front door hardware that is fit onto the exterior of the home lasts. Pollution and salt corrode and tarnish metal coatings quickly, that’s why our Nanocoast range has been constructed from grade 316 stainless steel which has been salt spray tested to ASTM B117 for 2,000 hours! This allows us to offer a LIFETIME coating guarantee on all products! 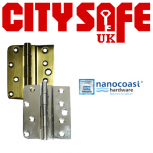 In our Nanocoast Door Hardware range you can find several fantastic products available three finishes: PVD Gold, Mirror Polished or Satin Stainless to ensure that you can meet your customer’s needs. Products include door hinges, Identity Card Slots and Door Knockers.